A recent audit published by the Royal College of Surgeons has found that m ore patients are surviving colorectal cancer following surgery. The audit data which was compiled from the results of patients undergoing colorectal cancer surgery in England and Wales found that 96.2% of patients were alive 90 days after their bowel cancer surgery. Although the audit was published in 2015, the results were collected from the years 2013 - 2014. The previous audit’s figures from 2009 - 2010 showed that 94.2% patients were alive 90 days after their bowel cancer surgery. The results also assessed patients undergoing both emergency and elective operations. It was found that patients undergoing emergency operation were more likely to die within 90 days of their operation. However their survival had also improved from 83 to 87% in this time period. The report also looked at the proportion of patients who had their bowel cancers diagnosed as part of the bowel screening programme. Only one fifth of those patients aged between 60 - 74 years of age were diagnosed as a consequence of having had a positive test as part of this programme. In England the test is offered to individuals aged 60 to 74 years whereas in Scotland the test is offered those aged 50 to 75 years. As one might expect it showed that patients were identified through screening had an earlier stage of cancer and were therefore more likely to be cured in the long term. The audit showed that overall, 67% patients were alive two years after their diagnosis of bowel cancer. Of those who underwent had an operation to remove the cancer, 82% of patients were alive two years after the diagnosis and surgery. One third of patients did not undergo surgery to remove the tumour. This is usually either because they have a very early cancer such as cancer in a polyp that can be removed during a colonoscopy. Alternatively patients who have very advanced cancer which has spread elsewhere may not be suitable for surgery. There have been many advances in the management of patients with bowel cancer over the last 10 – 20 years. 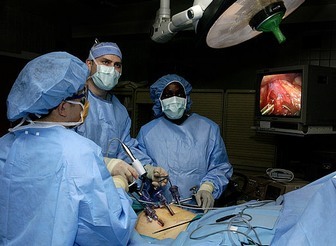 Many patients now undergone undergo laparoscopic or keyhole surgery which may lead to a faster recovery with a lower risk of complications such as wound infect ions or adhesions. The audit showed that at least half of patients have their cancers removed with keyhole surgery. In general, most patients can usually expect to be in hospital for around 5 to 7 days following an operation for bowel cancer. Following surgery around one in five patients may be readmitted because of some problem or complication as a result of their operation. Overall the results are encouraging and show that the prognosis and survival for patients diagnosed with colorectal cancer continues to improve year on year. This is related in part to improved surgery, earlier diagnosis due to the bowel screening programme and also improvements in chemotherapy and radiotherapy techniques which can be used in addition to surgery. Royal College of Surgeons. National Bowel Cancer Audit report—2015. 14 Dec 2015. www.hscic.gov.uk/bowel.